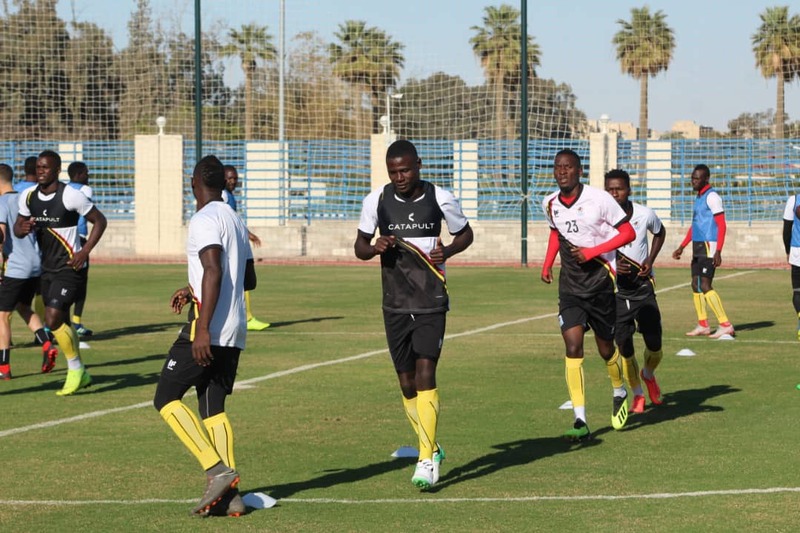 The Uganda Cranes have entered day two of their training camp in Ismailia Egypt. Sebastian Desabre’s side are gearing up for their last Group L qualifier away to Tanzania at the National Stadium in Dar es Salam on Sunday. Following the team’s first training session on Monday evening held at the hotel sports complex, the team returns to a double session on Tuesday. Speaking after Monday’s session, Cranes vice-captain emphasized that even if the team is not under pressure, they are gunning for maximum points come Sunday. “We are not under any pressure, said Wasswa. “They (Tanzania) are the team on pressure. “We shall fight for nothing but maximum points in Dar es salaam’ noyed Mawanda. Tuesday will see the players currently in camp train both in the morning and evening. Tuesday’s sessions will see five more players who arrived n Monday join camp ad feature in their first training. The players who arrived on Monday include team captain Dennis Onyango of Mamelodi Sundowns, Austrian based forward Edrisa Lubega, TP Mazembe’s Joseph Ochaya, India based Khalid Aucho and Al Hilal’s Salim Jamal. The sessions have also been boosted by French trainer Jerome D’Antonio, a close friend with Desabre. On Wednesday, the Cranes are expected to have a second build up game against an Egyptian 1st Division club. Their first was the 4-0 win over Kampala Select on Saturday, featuring only local based players. The team will then conduct more training sessions on Thursday before flying out to Tanzania on Friday. Uganda have already qualified for the 2019 AFCON and will maintain top spot no matter the results from their last game. Denis Onyango (Mamelodi Sundowns, South Africa), Murushid Jjuuko (Simba, Tanzania), Timothy Awany (KCCA, Uganda), Joseph Ochaya (TP Mazembe), Jamal Salim Magoola (Al Hilal), Edris Lubega (SV Reid, Austria), Khalid Aucho (Church Hill Brothers, India), Halid Lwaliwa (Vipers, Uganda), Geofrey Walusimbi (Free Agent), Joseph Ochaya (TP Mazembe, DR Congo), Nico Wakiro Wadada (Azam, Tanzania), Hassan Wasswa Mawanda (Free Agent), Tadeo Lwanga (Vipers, Uganda), Ibrahim Sadam Juma (KCCA, Uganda), Moses Waiswa (Vipers, Uganda), Emmanuel Arnold Okwi (Simba, Tanzania), Allan Kyambadde (KCCA, Uganda), Allan Okello (KCCA,Uganda), Henry Patrick Kaddu (KCCA, Uganda).